The Bengals put up a valiant effort in Paul Brown Stadium, but ultimately they were defeated by the Pittsburgh Steelers 23-20 on a last second field goal. RB Giovanni Bernard came in for the injured Joe Mixon and rushed for 77 yards on just 13 carries, helping balance out a night where QB Andy Dalton threw the ball 36 times for 234 yards and two touchdowns. Both of those touchdowns went to WR A.J. Green. QB Ben Roethlisberger had 290 yards himself, throwing two touchdowns versus one interception, and RB Le’Veon Bell rushed 18 times for 76 yards and contributed 106 yards receiving as well. He scored one of his five receptions when the Bengals didn’t finish forcing him out of bounds and he trotted the final stretch of the field uncontested. WR Antonio Brown tied the game late with his own receiving touchdown. The Steelers would need every second of the game clock to come out on top, as with just two seconds left on the clock, kicker Chris Boswell kicked a field goal that put the Steelers up for good. With that, we give you our PFF-exclusive takeaways from the contest for each team. With pre-game questions as to whether Brown would be effective enough to even play, he put on quite a display of toughness on Monday night. Brown was targeted a whopping 15 times catching eight balls for 101 yards and the game tying touchdown, where he held onto the ball after taking a viscous shot from George Illoka. Brown almost caught another touchdown but the ball was dislodged as he went to the ground. Brown was also able to draw a pass interference penalty at the end of the half to get the Steelers some much needed points going into the locker room. 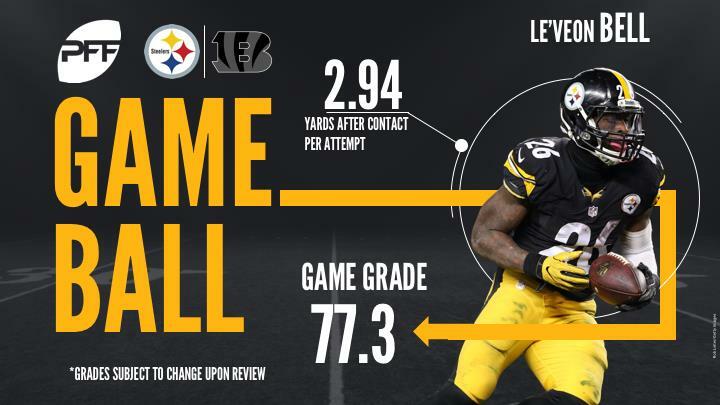 Although Bell got off to a slow start for the Steelers, he was absolutely integral to the Steelers’ ability to move the ball. Bell’s 182 yards from scrimmage accounted for 47.6 percent of the Steelers’ scrimmage yards. Without holes that opening up immediately for Bell, he had to account for many of his rushing yards himself, with 53 of his 76 rushing yards coming after contact. Bell was a much larger force as a receiver though, catching five of his six targets for 106 yards including a catch where he toed the sideline so well that the three Bengal defenders surrounding him gave up on the play as Bell waltzed into the end zone. His production was also crucial in the final drive to set up the game winning field goal. Burns impressed in coverage Monday Night, leading to a grade of 84.6 in that category. He was thrown at six times, allowing only two catches for 25 yards while recording a pass break up and limiting Bengals receivers to one yard after the catch. Burns held his own while in coverage against A.J. Green, not allowing a catch on three targets. Heyward didn’t necessarily fill the stat sheet but was able to shed blockers and clog up his lane in the run game, leading to a run-defense grade of 81.9. The Steelers were able to generate 13 pressures against the Bengals but Andy Daltons 2.16 average time to throw was often too quick for the pass protection to break down. Heyward has enjoyed a successful season so far, recording 27 run stops and 53 total pressures. A.J. Green was targeted a season high 15 times, surpassing his previous high of 13 targets. He caught 7 of those targets for 77 yards but dropped a pass which would’ve resulted in a crucial first down. Green was slowed a bit in the second half but was able to score two touchdowns and Dalton had a passer rating of 101.9 when throwing his way. Dalton has a history of struggling in prime time games but the same can’t be said about this Monday night. He put up solid numbers in the passing game while not turning the ball over. When given a clean pocket, Dalton went 18-of-27 for 195 yards and two touchdowns. He was also able to find success in the intermediate passing game going 5-of-13 for 88 yards and two touchdowns. Dunlap, who continues to be one of the most important pieces on this Bengal defense, had another outstanding game rushing the passer on Monday night. Dunlap accounted for half of the defense’s total pressures, totaling three hurries, a hit and a sack. Dunlap finished with an 83.4 pass-rush grade, which led all defenders in the game. It looks like the Bengals may have found a key secondary member for the years to come against the Steelers. Jackson added to his outstanding year by allowing two catches on five targets for only five yards receiving. He was perfect against Antonio Brown in coverage, not allowing a reception on three targets and had two passes defensed. Against Brown, arguably the best receiver in football, this season Jackson has not allowed a reception on seven targets and has four pass break ups. With locking down Antonio Brown as a key to any defensive plan against the Steelers, Jackson may have found himself a spot in Brown’s hip pocket for years to come in this AFC North rivalry.